The iPhone maker is looking to sign long-term supply deals for cobalt, a key element in the lithium-ion batteries used to power smartphones. Technology giant Apple (NASDAQ:AAPL) is looking to sign long-term cobalt supply deals directly with miners, sources told Bloomberg on Wednesday (February 21). Apple joins carmakers such as BMW (ETR:BMW) and Volkswagen (FRA:VOW) in the race for cobalt, a key element in the lithium-ion batteries used to power smartphones and electric cars. 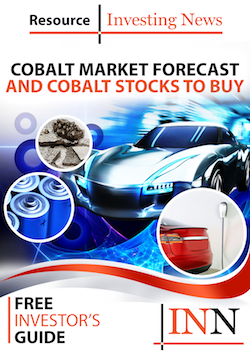 With demand for electric cars set to surge in the years to come, the need for cobalt is expected to grow. The iPhone maker is aiming to ensure that a potential shortage of cobalt does not hit production for its gadget in the long-term. While smartphones require only about 8 grams of refined cobalt, electric cars use over 1,000 times more. Apple is seeking contracts to buy several thousand metric tons of cobalt for five years or longer, sources told Bloomberg. In December, Glencore (LSE:GLEN) CEO Ivan Glasenberg said the company was in talks with the tech giant, among other companies, about supply contracts. Similarly, German automaker Volkswagen has been looking to secure long-term deals with cobalt miners without success, while BMW is said to be close to signing an agreement for lithium and cobalt supply. On Tuesday (February 20), Australian Mines (ASX:AUZ) signed an seven-year cobalt offtake agreement with battery maker SK Innovation (KRX:096770), a move that might become more common in the next several months, according to analysts. More than 50 percent of cobalt comes from the Democratic Republic of Congo (DRC), the world’s top cobalt-producing country, where mining has been linked to human right abuses. In 2016, Amnesty International exposed a connection between child labor and the battery supply chains of leading electric vehicle and electronics companies such as Apple, Microsoft (NASDAQ:MSFT) and Tesla (NASDAQ:TSLA). Last year, Apple became the first company to publish the names of its cobalt suppliers, leading the way in tracing cobalt sources and stepping up efforts to ensure the metal used in its electronics has not been mined by children in the DRC. Despite being in talks with downstream companies to secure cobalt supplies for about a year, Apple may end up deciding not to go ahead with a deal, Bloomberg said, citing another source. On Wednesday, shares of Apple closed up 0.68 percent, at $173.03. The company’s share price has increased 2.24 percent year-to-date.